GDG DevFests are large, community-run events that can offer speaker sessions across multiple product areas, all-day hack-a-thons, code labs, and more. For the first time such an event is being organised in Belgaum by Google Developers Group (GDG)Belgaum Chapter. 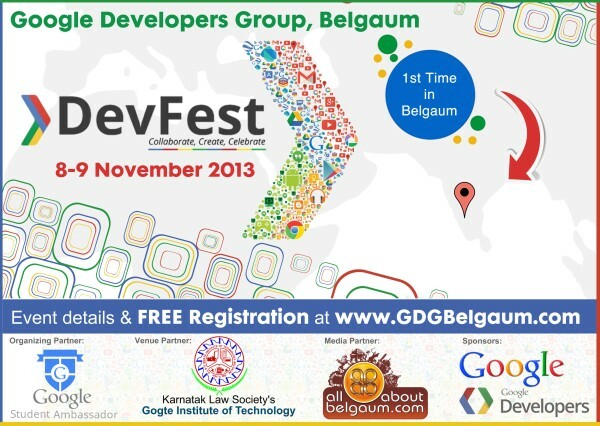 GDG Devfest 2013 will be organized by GDG Belgaum on 8th & 9th of November 2013. This is a part of global GDayX (community driven annual event of Google). It will be 2 packed days with talks & workshops around popular Technologies. – Google Cloud Developer Challenge with chance to win prizes that include Android devices and up to $20,000 USD. There are limited seats with Google Swags up for grabs. Google Developer Groups (GDGs) is a community of passionate developers who code, collaborate and contribute to the community. The community aims to learn and share about the Google Developer Technologies – starting from Android to App engine platforms, various APIs and everything that you can imagine in this particular domain. GDG Belgaum, is the Belgaum chapter of GDG, an open and non-profit group which aims to achieve the above mentioned aims in the Belgaum region. GDG Belgaum also recently marked the celebration of one year successful and eventful completion.